Product prices and availability are accurate as of 2019-04-18 13:04:42 UTC and are subject to change. Any price and availability information displayed on http://www.amazon.com/ at the time of purchase will apply to the purchase of this product. 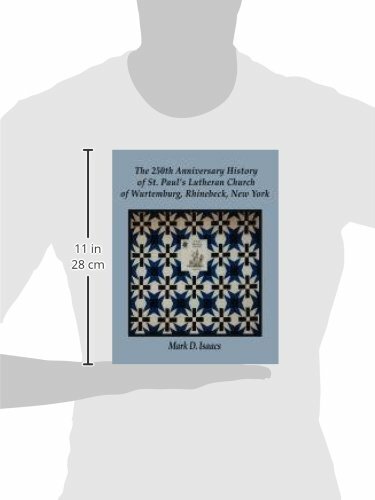 Author Bookstand is proud to offer The 250th Anniversary History of St. Paul's Lutheran Church of Wurtemburg, Rhinebeck, New York by Bookstand Publishing. Bookstand Publishing offers books by the best indie authors throughout North America and the world. Bookstand Publishing is dedicated to offering original content to a broad audience and promoting great authors, literacy, and freedom of expression. The 250th Anniversary History of St. Paul's Lutheran Church of Wurtemburg, Rhinebeck, New York has generated a lot of interest and excitement and we think it would be an excellent addition to your library. I have had the privilege of serving as Pastor of St. Paul's Lutheran Church of Wurtemburg, Rhinebeck, New York for the past 14 years. And, I have lived in the historic 1870 Wurtemburg Parsonage since January 1, 2000. During this time, I have walked the cemeteries and studied the headstones. I have spent time alone in the church reading memorial plaques and culling through the well-ordered archives. I have spent many happy hours rummaging through the crevasses, corners, and cupboards of the old church seeking bits of information. I have also spent time listening to the stories and the recollections of lifelong members, as well as community leaders and local historians living in the Rhinebeck, New York area. During this time, I have sought "Verstehen," a deeper understanding of this special place, and of the people who lived, worshipped, and died here. Who were these people? And, why did they found, struggle, and support this special country church? This book is a humble record of my findings and discoveries. For the past several years, I have endeavored to assemble bits of information, dates, old photographs, stories, and maps attempting to weave this material into a coherent narrative, so that these precious memories might help current members gain a deeper appreciation of this remarkable 250-year-old congregation. I also hope that this work will contribute to the preservation of this material for future generations.